Access to many regions is still blocked. There is concern about an increase in the number of victims. There have been floods in many cities, towns and villages in the Iranian provinces of Golistan, Khorasan, Mazanderan, Kuzistan, Gjilan, Shiraz, Loristan. These unprecedented floods reportedly hit 25 of the 31 states. Some sources report that at least 43 people have died, but no official balance sheet has been released yet. The Iranian state TV reported on Monday that at least 11 people were killed in flash floods in Iran's southern province of Fars. The provinces that were most affected by the disaster were Golestan and Mazanderan. According to the national television IRINN, at least 70 villages in Golestan and more than 200 villages in Mazandaran were flooded. In Golestan, 20 villages were evacuated. Contacts with many villages are cut off because of the falling of Selin bridges. In the state of Mazandaran, about 1,500 houses were damaged in urban areas, while 30 to 50 percent of rural houses were damaged. The disaster caused power cuts and clean water problems in rural areas of Golestan province. Those responsible for the crisis management in Iran reported that electricity has been cut off in 40 villages in Golestan. Shiraz, the capital of Shiraz province, and many villages and towns of the city, as well as Pol Doxter in Loristan and Gilan, have suffered floods. At least 11 people were reported having lost their life in Shiraz, while at least one person was killed in Loristan. The actual magnitude of the damage has not yet been determined. However, according to the Tehran Times, especially in areas of the Caspian Sea coast, there is a loss of 392 million dollars in the agricultural lands. Mohammed Mousavi, the Ministry of Agriculture, stated that a loss of $ 260 million occurred in the province of Golestan, while 250 thousand hectares of agricultural land were heavily damaged in the province. According to the IRNA news agency, the Ministry of Interior said that the people would be compensated for their losses, but the government did not follow through with their promises in previous disasters. Even the damages caused by the earthquakes were not met. Experts are pointing the finger to the increased floods in Iran which have caused a 30% deforestation in the north of the country, as well as the degradation in the pasture areas, inadequate dams, lack of walls against floods in areas at risk. According to the official media, the government destroyed 33% of Iranian forests as a result of its deforestation policy. This means that Iran has been left with 12.4 million hectares from the original 18 million hectares. 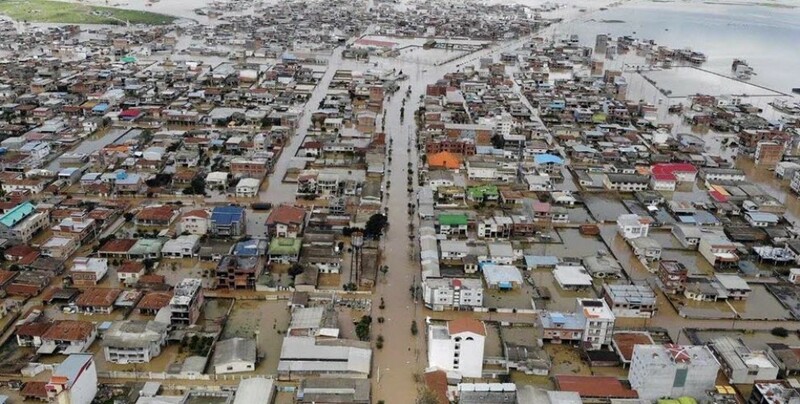 Last October, 8 people died in the floods in the northern states of Khorasan, Mazandaran and Gilan.